If you perform a calculation that multiplies the number of marketing emails you receive by the amount of time that would be required to read all of them and respond to the ones that are expecting a reply, you may be astonished. It can become unmanageable. However, there are some techniques you can utilise to increase your ability to get others to act upon your emails and assist you in writing effective marketing emails that work as well. When crafting your email marketing the first thing you should consider is who the voice of the email is. Whether you are creating an auto-responder email series or writing an email to broadcast, you must determine who the originator of the email is. Keep in mind, your email involves building trust, entertaining your recipients, and building relationships. Sales occur as a result of those factors. When you create an email you should have a clear concept of what your goal is, or what you are attempting to achieve. For example, sometimes your goal may be to create a sales pitch with the goal of making sales. At other times, you may be supplying content to your recipients with a goal of building trust and adding value. Some of your emails may be about you, with a goal of building authority and establishing you as a leader in your industry. Still other types may be generated to thank a customer for making a purchase. Therefore, you need to determine your goal before you begin writing. 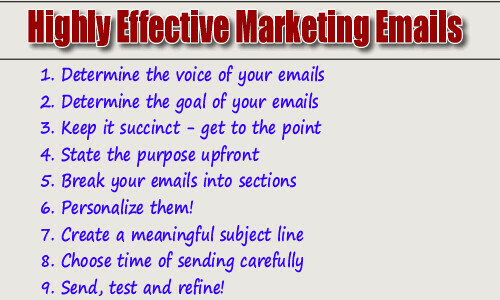 Having your goal firmly in mind will make it much easier for you to produce effective emails. Quite often marketing emails are long and rambling. On important emails it is best to condense your content down to what is necessary. Most people will not spend the time it takes to read long emails. Get to the point, less is usually more when it comes to email. Many emails are written without a clear purpose or call-to-action. Be sure that you state your purpose and if no action is necessary, state this at the outset. For example you could write “For informational purposes only”. Some marketing emails can get rather complex and require you to include a lot of background information. In this case it is still a good idea to list the action you expect near the start of the email. Key dates or vital information can often be placed in red or bold to get the recipients attention. For longer marketing emails, where a lot of background information is required, it’s a good idea to create several sections. An email is easier to follow when you have it divided into various sections. This also makes it easier for a recipient to scan your email for the content they want. People who receive an email and see a long page of continuous text will frequently just delete it and go on to another email. If you provide an upfront action and put it in bold, at least they will understand what your expectation is. This is a crucial point. People are far less likely to respond to an email they feel was directed at a group. Any psychologist will tell you that. A good way to accomplish this is to create the bulk of the message with general content. You can then generate multiple versions of it. Then add the name of the recipient to the top of the email and add a short personal note to each email. Certainly this will take more time and effort than simply creating group email. For emails that are not so crucial, you may still want to send them to a group. However, if they are important emails, you will get a much better response if you personalise them. Subject lines are extremely important. People scan the headlines of their sales emails to determine which ones are worth opening. Therefore, it is very important that you take time to create a relevant and meaningful subject line for your emails, or they will not be as likely to be opened. It’s not a good idea to send out emails that are important on a Friday afternoon, unless is something that requires action immediately. If you write emails on the weekend, then send them out early Monday morning. You will want to be on the top of the list, not on the bottom of a large pile. Most individuals will process their emails early in morning at the start of their day. To become an email marketer who is effective, you need to analyse your results. Then you need to make alterations in your emails and continue to test. You need to examine the rate at which your recipients open your emails and the rate at which they take the actions you desire. You won’t ever reach your maximum potential on your initial try. Therefore you need to test additional styles, formats, subject lines, and images. You can test formatting your emails with inline CSS as well. Testing is the real key to success. Cameron Francis is director of eTraffic Web Marketing – local SEO Company providing a strong online marketing platform for Australian Businesses. You can follow him on Google + and Twitter. This applied evenly to email marketing. These are various techniques that can help you write an effective marketing email that will surely work to your audience. You just need to determine the voice of your email marketing, the goals of the sales email, make it brief and direct to the point, state the purpose of the email and make it more personal. Whatever technique you have it all pays testing to see if it works! These techniques are really relevant in email marketing. Thanks for this!